As a story, the Lion King is one of the all-time greats. It has all the elements of a truly satisfying plot – a bright beginning, an unjust reversal, exile, vindication and happily ever after. It has unforgettable characters – the wise old Mufasa, the reckless young Simba, the sadder and wiser older Simba, the feisty Nala, the evil Scar and his retinue of sly hyenas, the flapping loudmouth Zazu and the wisecracking comics Timon and Pumbaa. It has a spectacular African jungle setting. Then, there are the unforgettable Elton John/Tim Rice music and lyrics. As I headed off to the stage version of the lion King, I was having difficulty clearing my mind of dominating Disney images of cuddly lion cubs and dark canyons with hordes of buffalo stampeding through clouds of dust. I couldn’t imagine how African dawns, elephants and giraffes would translate convincingly to the stage. It is carried off, and brilliantly, by sets, props, costumes, masks and puppets and by a cast of wonderful actors, singers and dancers. The opening scene is a parade of colour, sound and movement that are almost overwhelming. From the back of the theatre comes a train of giant elephants worked from within by actors. There are giraffes, formed from stilt walkers. Hyenas are half actor-half puppet. The lions are robed in rich, African cloth in kingly reds and gold. Their leonine character is portrayed through masks and head-dresses. A huge feathered head and beak represents Zazu. Dancers dance out fleet footed gazelles, others in coolie hats whirl a background of birds, butterflies and insects across the stage on poles. Wildebeasts are formed from bicycles. Stampedes play out as shadows on a dramatic jungle backdrop. The music, live, is amazing. The great story works, without all the technical wizardry of film, just with that subtle magic of suggestion and imagination that is the theatre. The proof? – the group of kids across the aisle, hardened and critical veterans of You Tube TV and DVD. They were on the edge of their seats, spellbound, open-mouthed and shiny-eyed from beginning to end. 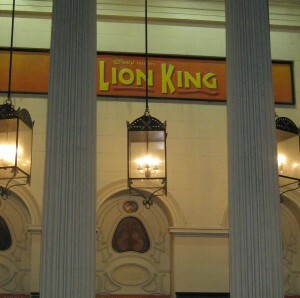 The Lion king is in its last days in Melbourne. Catch it if you can!